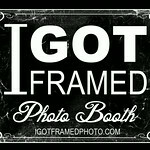 I Got Framed Photo Booth is a great Photo Booth Experience for all of your guests. With fun and creative props, high quality photos, and a friendly staff! Want to kick off the party right? Have your friends, co-workers, family walk in and see a photo booth. With the picture props we bring and the many photos opportunities we offer, the party will be talked about until the next year when you do it again! Call today to reserve your event date for a photo booth and more! Make your wedding or event truly memorable by sending your guests home with a picture. They’ll get an instant printout of their photo booth session that they can take with them right away. For corporate customers, turn that printout into a powerful marketing tool for your brand by putting your name on it. Put your logo on the photo strip or brand the outside of the photo booth and make your guests remember where their photos came from. Headquartered in right here in Ohio, I Got Framed Photo Booth Rentals will supply the attendant and photo booth at any Ohio Or Michigan Area Event. Renting a photo booth is the latest trend and the best way to liven up your wedding, dance or corporate event. Not only will it give your guests an excuse to act silly and have some fun, but it will instantly provide a token for them to remember the day and treasure always.